Amarigatachi (English: overwrought shape) is a misfired attack, where one player fails to benefit from an attack and usually ends up with a less favorable position than before the attack. 1) Currently, the word is mostly used with strategical meaning; that is, a player finds himself behind in territories after his attack has failed. 2) In the past, the word was sometimes used with more tactical meaning, as in the following example (from the book Killer of Go, first published in 1967). 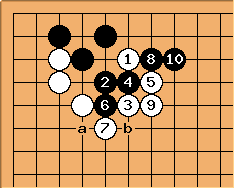 This is a corner pattern in which White attacks at the vital point of Black's shape, instead of extending along the left side. White tries to trick Black into cutting at with his move . Black however calmly cuts at instead as he knew what White was trying to do. White's attack has misfired and now he's left with two cutting points, a and b. This bad aji resulting from an overly aggressive line of play, is what is known as amarigatachi. Amari is noun form of amaru, which is intransitive verb of amasu (remain ahead in territories; See Amashi strategy). Therefore amaru in go context is, 'one gets behind in territories by his own initiative'. And -gatachi is vocalized form of katachi, or shape. John F. Amarigatachi doesn't really have anything to do with thinness or korigatachi, or leftovers. The amari refers to having overdone things, specifically here attacking too hard, usually starting with an overplay, and if the resulting attacker's shape looks solid or powerful or effective but actually has pernicious defects (the defender lives or escapes, of course), that is amarigatachi. Thinness implies open spaces - a typical amarigatachi shape is solid-looking. It is true that amarigatachi cannot be thickness (even if it was meant to be), but the opposite of the intended thickness is not thinness here but amarigatachi. Also, far from being the opposite of korigatachi, amarigatachi tends to end up as being effectively the same because the defects have to be patched up. The way amarigatachi is usually used (e.g. as in amarigatachi ni sareru), there is more than a hint of a weaker player being gulled into making an overplay. You might say he has been has been amashi-ed. 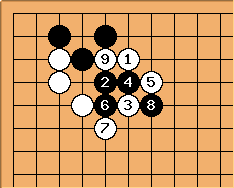 According to Bob Terry's translation of Killer of Go, it would be equivalent to the chess term "exhaustion of possibilities". Amarigatachi is sometimes translated as overdeveloped. yet I feel quite sure having encountered this in a Go book. I interpreted it as a warning w.r.t. amarigatachi. The concept is well illustrated in the first section of Chapter 2 of Attack and Defense, though James Davies didn't use the Japanese term there. The article on Huang Longshi at http://www.msoworld.com/mindzine/news/orient/go/history/longshi.html (defunct) has an interesting comment, too.